Home » Blog » General » How Online Poll Can Help Small Businesses? 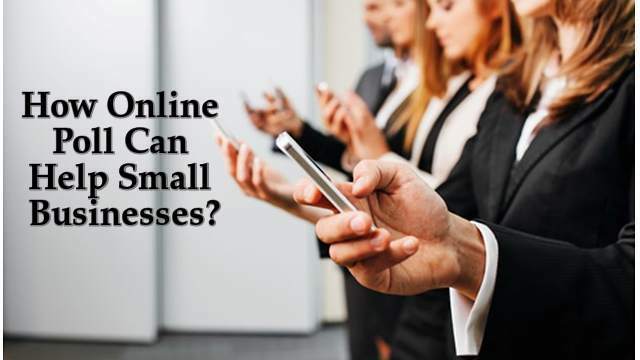 How Online Poll Can Help Small Businesses? Whether you are running a multinational corporation or a small business, your every step revolves around customer. Customer’s needs, tastes, preferences, likes and dislikes form the basis of your business decisions. If you want to grow in the long run, you must understand the pulse of your customer. Since small business has to make a mark and survive in the competitive market, the importance of online survey is even more for them. Online poll has made the task of engaging with customers both easy and economical. Within the shortest span of time, online survey gives you huge volume of data for business decision-making. You can ask several questions from the target audience with just a click of your mouse. You just have to upload the questionnaire which can be filled by the participants. Your respondents can give their reply according to their feasibility. The flexibility to add or delete questions in the questionnaire and the feasibility it offers, make online survey a big hit among both business and respondents. It allows the business owners to uncover profitable patterns and trends on the basis of valuable inputs gathered. Though useful to small business owners, many business owners are reluctant to use online poll. They have the wrong notion that it will be time-consuming and will involve lot of money. To their surprise, online survey appears out to be the most effective and efficient mechanism to get customer’s information. It brings down the cost and time consumed considerably as compared to other forms of data collection. All it takes is a few clicks and your online survey can be created and distributed to huge number of people. You can further share your results on various social-media sites which will in return give you positive response and more business. If you want to further analyse the data for other use, that is also possible with online poll. Being new in the market and having a tight budget, new business should go for it. It does not require an experienced and expensive consultant to decipher the data collected. The data can be tabulated on the basis of various defining factors such as age, location, etc. The data so gathered can be used to calculate various statistics. The online survey provides tremendous possibility of comparing, analyzing and managing data according to your various business needs. Small business can opt for online poll for getting various customer’s insights which will help them in taking the right decision. PollDeep, the ultimate online poll creator can help you design and conduct the most relevant poll for your business. With latest features and technology, PollDeep has everything which makes it a strong and comprehensive poll creator. It has everything what it takes to become the most flexible and complete poll builder which can conduct, control and manage online survey. You can also share the result obtained on various social networking sites. So trust your intuition and conduct an online poll, your small business will never be the same again.